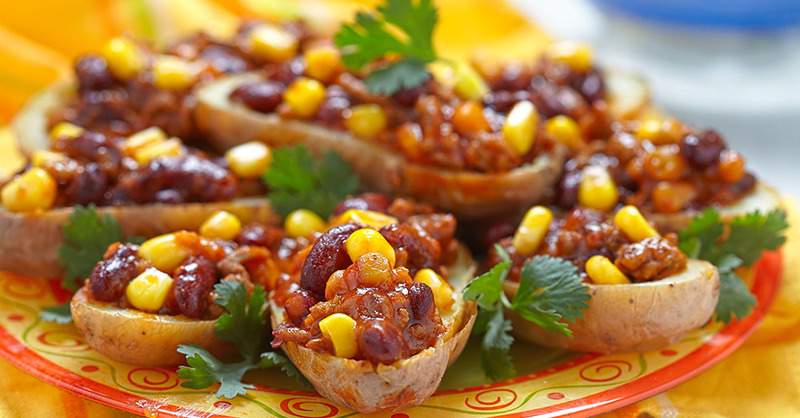 If you love Mexican and American cuisines, try this hearty recipe for potato skins stuffed with chili con carne. These spicy potato skins offer a delicious alternative to traditional meat and potatoes. This version is made with ground beef, but you can substitute diced chicken if you want a leaner option. Top the potato skins with cheese and serve with guacamole or a side salad to create an easy meal that satisfies all the food groups. Adjust the spice level to your family’s preferences. If you want a little more kick, add a dollop of salsa to each potato skin just before serving. Preheat oven to 450 degrees Fahrenheit. Wrap potatoes in aluminum foil and bake for 90 minutes or until tender. In a large skillet, brown ground beef over medium heat. Add diced onion and garlic, and cook until onions are semi-translucent. Add diced tomatoes (undrained), corn, kidney beans, tomato paste, cumin, salt, pepper and chili powder to meat mixture. Cook over low heat for 15 minutes. Slice potatoes in half lengthwise and scoop out potato. Combine potato filling with meat mixture. Scoop chili con carne and potato filling into potato skins. Place skins on a baked sheet and sprinkle with grated cheese. Return potato skins to the oven for five minutes or until cheese is melted. Top with a dollop of sour cream and a sprinkling of green onions. Garnish potato skins with fresh cilantro leaves and serve.